Ankit's socio-political blog: Why India needs another Mahatma, Loknayak or Lokmanya. Why India needs another Mahatma, Loknayak or Lokmanya. I still haven't been able to find a satisfactory enough answer to this question but then I did have a few conflicting thoughts in my mind thus I decided to write them down. Going by India's history during the Independence movement and the Sampoorn Kranti (Total Revolution, a highly under-rated event in India's history but whose implications are visible all around us till today) one can say that for any movement to be successful there has to be a prominent leader, a face whom the common people can rally behind. The Jasmine revolution in Egypt was an exception but at the same time in Egypt there is still a leadership crisis. I don't think we Indian's will let such a situation occur here. We are a much stable state than Egypt or 90% (and I think I'm being conservative) of the world's countries. This does not mean that a change is not needed! If someone steals even a blade of grass from our courtyard then we Indians are ready to fight tooth and nail, so we do need to do something if someone made away with Rs 1.76 lakh crore, another one with Rs 8000 crore. And this is just the tip of the iceberg. An estimated $1.4 Trillion of Indian money is stashed away in Swiss banks. This is enough money to take India into the league of developed nations over the next decade. Isn't just that reason enough to ask for a change? The big question before me and many other people like me is whom to align with? Till now many individuals and organisations had been fighting against corruption but none of them had a mass following. 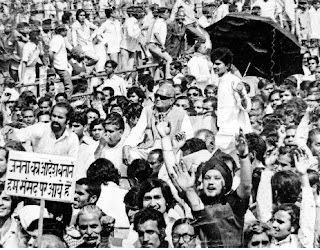 They were small groups of few people, not people with mass following which is important in a democratic setup to make yourself audible to the government. Indian public needs a person who they can rally behind, who they have faith in, who they can look up to. And I'm sorry to say that there is no single individual in India to whom I can point out and say, 'Yes, he can be the next Gandhi, JP or Tilak.' Most (if not all) politicians today are directly or indirectly corrupt. They either take money directly or through their aides and stash it in their Swiss bank accounts. The social workers are there but their domain of work has become so specialized and centered in a specific area that they are hardly recognized outside their town or state. The power that Gandhi and JP wielded in oratory terms and mass appeal is something that most of these social workers lack. The media is also more interested in finding the steps of heaven or some blood colored river leading to hell than telling us what actually is going on in our country. A few people here and a few activists there do make a difference but is that enough? Doesn't the common man deserve to be a part of this anti-corruption fight? I think he does and he wants to but he does not know how to. For past few weeks I have been hearing about Yog guru, Swami Ramdev giving speeches on anti- corruption and nationalism and I was a bit surprised. To be frank I've never been a fan of Baba Ramdev, more so after I came across a young gentleman in a train who was taking his mother ailing from Cancer to Baba's ashram in Haridwar rather than some doctor. That day onwards I had decided not to be a part of any activity even remotely related to him and that included not practicing the yoga he taught and not buying the juices and oils he sells through his outlets all over the country. No hard feeling but this how I am! For the first few days I took baba's comments to be just another gimmick but when people from eminent citizens from different strata of life started to rally behind him I did sit up and take a note of it. Even for a secular country like India it is not usual for a Swami to be invited to give a speech at a convention of Muslims in Deoband. Thereafter Congress party's attacks on Baba raised further suspicion that may be Baba was on the right track. It is not everyday that the Congress or any other party for that matter pays heed to what general people are saying. Yes, I included Baba Ramdev in general people, I still do. He's doing what everyone in India thinks of doing but cannot do as they have families to feed. Thereafter I came to know about the launch of 'India Against Corruption' campaign and I attended their rally at Ram Leela grounds in Delhi on 30th January. If I was asked to put the experience in one word I'd say, 'Electrifying'. I wasn't there for long, just about an hour or so as I had other things to attend to but that one hour was one of the most intriguing ones in my life. It made me think about a lot of things going around me and to some extent it was also the reason I started with this blog. With people like Sri Sri Ravishankar, Swami Agnivesh, Arch Bishop of Delhi Vincent Concessao, Mahmood A Madani, Anna Hazare, Kiran Bedi, J M Lyngdoh, Shanti Bhushan, Prashant Bhushan, Arvind Kejriwal, Syed Rizwi, Mufti Shamoom Qasmi, Mallika Sarabhai, Arun Bhatia and Sunita Godara rallying behind Baba Ramdev it would be a surprise as well as disturbing if this movement fails. A bigger challenge before Baba and his colleagues (not followers, but colleagues) would be to help the general public develop an anti-corruption mindset because bribes are accepted because we are willing to bribe. Until and unless this mindset changes this and many more movements would be useless. Gandhi Ji and JP are two examples of revolutionists who did achieve their short term goal but failed in their long term goals primarily because the people who came into power after the movement were as corrupt (if not more) than the outgoing establishment. This is something that Baba, Anna Hazare and others need to keep in mind. Throwing out one corrupt government and replacing it with another equally corrupt one would not do the job. JP has already shown us that it doesn't work. If these people are indeed serious about rooting out corruption then they should also provide an alternative to the current available choices. A formidable choice, not just a 'this would do' one. I hope that this movement would achieve what it is aiming for and make India a better place. People like me are waiting to become a part of the change. Corruption is a worm which is eating India from inside..Best way to stop corruption is to stop giving money!!! Dena band karo...lene wala kaha seh lega? A small change can make big difference..an I think gov shuld start a website or easily reachable telephone numbers where a common man can directly file a complaint against corruption...and more imp they should react immediately..